Each mini pack of 5 crayons sold separately. 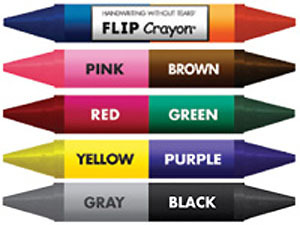 Each crayon has two points, each a different colour. That means 10 colours in all! The shorter length encourages a tripod grasp and the dual ends encourage 'flipping' within the dominant hand which helps develp the hand skills that contribute to pencil grasp and control! Form capital letters and numbers rolling dough snakes with Roll–A–Dough Letters™. Use the tray with sand, shaving cream, or rice for additional practice. The chalkboard is made of real slate, measuring 4" x 6", in a sturdy wood frame. The Wood Pieces Set and activities help children develop fine motor, social, vocabulary and letter formation skills. Children learn joyfully with the multi-sensory readiness activities in My First School Book. This updated version of the award-winning Get Set for School activity book helps children of different abilities develop crucial readiness and pre-writing skills. 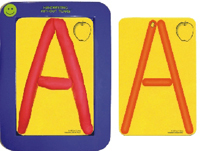 HWT's gray block paper helps children learn correct placement (no reversals) of capital letters and numbers. Kindergarten Teacher's Guide is the guide for the kindergarten workbook, Letters and Numbers for Me.